The flagship was named in a glamorous and traditional maritime naming ceremony in the port of Southampton. A host of stars, VIPs, key travel partners and international media attended the event as well as top management from MSC Cruises and its parent company MSC Group. Gianluigi Aponte, MSC Group’s founder and executive chairman as well as the ship owner, attended together with the Aponte and Aponte-Vago families. MSC Cruises’ godmother Sophia Loren officially named her 14th ship, which is fitting since the glamorous Hollywood legend is renowned for her style and elegance. MSC Cruises also announced a new partnership with one of the finest chefs in the world, Raymond Blanc, OBE. The two-Michelin-starred chef has had a profound influence on Britain’s culinary landscape and to kick-off the relationship, VIP guests at the Naming Ceremony were able to enjoy an exquisite menu that chef Blanc has designed for the Yacht Club Gala Dinner. This marked the start of a new collaboration with MSC Cruises and the celebrated chef who will be creating a dish for the Elegant Dinner menu. Hosting the evening’s celebrations was English TV presenter and star of ITV, Holly Willoughby. Additionally, world-famous tenor Andrea Bocelli and Matteo Bocelli sang a duet to begin the event. The Bocelli family have a long-standing relationship with MSC Cruises dating back over 10 years when Andrea first performed for the Naming Ceremony of MSC Poesia in Dover, UK. Guests also experienced a very special performance from Cirque du Soleil at Sea. This performance marked the first time that the world-leader in live entertainment, Cirque du Soleil, has performed at the launch of a ship. 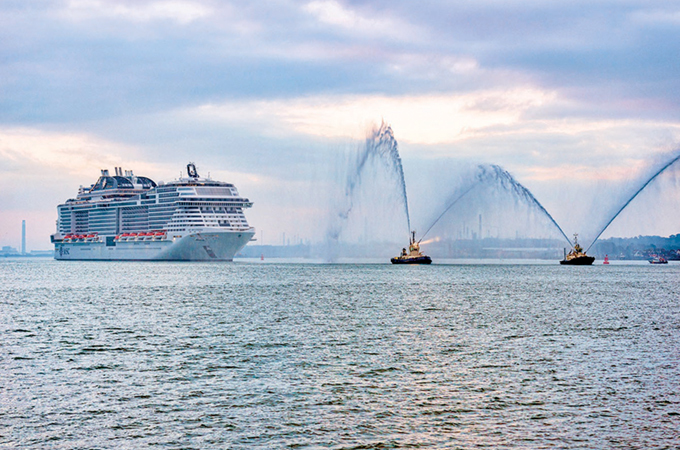 MSC Bellissima is the second Meraviglia class ship to come into service, designed as the ship for all seasons and rich in guest features, including the very latest guest-centric technology with the introduction of the world’s first virtual personal cruise assistant, ZOE. Another key highlight is the two new Cirque du Soleil at Sea shows, exclusive to MSC Cruises’ guests. SYMA – Sail beyond Imagination takes you on the epic journey of a young sailor, brimming with imagination. VARÉLIA – Love in Full Colour puts a futuristic twist on a traditional medieval tale. With 12 dining venues and more than 20 bars and lounges, guests are spoiled for choice including a new French specialty restaurant L’Atelier Bistrot. The ship also features acclaimed pastry chef Jean-Philippe Maury’s Chocolate & Café, dedicated entirely to unique and elegant chocolate creations and desserts. MSC Bellissima will spend her inaugural season in the Mediterranean offering seven-night cruises to some of the region’s most popular ports before moving to the UAE for winter 2019/2020. Following that she will be deployed in Asia in 2020.